A visit to Ottawa County's Grand Haven will find bustling activity along the waterfront. Here you'll find Michigan's longest river emptying into Lake Michigan after smoothly gliding along the breakwater pier. The Grand River offers opportunities for fishing fleets, Coast Guard vessels, and pleasure boaters to ply their transports out onto the big lake. Whether visiting the beach to relax or play volleyball, one can't help but notice the mesmerizing sight of the breakwater. A series of lights draped like holiday lights run along the pier, only broken in the middle by the sight of a lighthouse. This inner lighthouse, built in 1905, is typical in style to many of the lighthouses we're familiar with. The round tower looks elegant in its vivid red with lights stringing out on either side. As we follow the lights towards the lake we come to the breakwater's second lighthouse. This outer light, built in 1875, has its own charm and resembles a small barn in appearance. At one time the outer light was equipped with a fog horn which could warn ships in harm's way when the light could not be seen. The west side of the light sports a structure similar to the bow of a ship. This protects the light from the heavy swells so common on Lake Michigan. 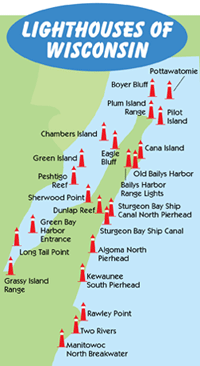 The U.S. Coast Guard determined in 2009 that it would no longer maintain the lights, and they are now owned by the City of Grand Haven. 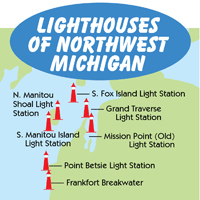 However, they are maintained by the Grand Haven Lighthouse Conservancy, a group dedicated to "keeping the lights on". 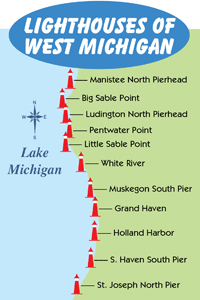 If you are visiting the Grand Haven area, make sure and take time to visit these grand old structures. Take a walk along the pier, enjoy the cool lake breeze, and get a feel for the history of these charming lights. 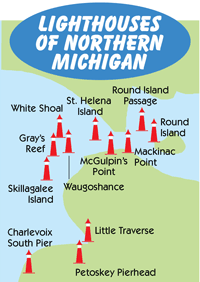 Make sure and schedule some extra time for relaxing on one of Michigan's finest beaches!